Relations between China and the US have experienced bad times and good times over the several decades. The two countries, overall, have been living in peace with each other with only occasional small spats. The stable development of US-China relations has been the main reason that world economy is gaining momentum. Without it, there would be no stable globalization nor the last 40 years of prosperity for the world. The 40 years was a continuous tug-of-war between China and US. In this long lasting tug-of-war, both sides have used every method to avoid losing out to the other party. Sometimes the two equal footing countries would voluntarily give each other a break, readjusting themselves to get back on the horse. During the last 40 years, the two countries have forged diplomatic relations, and from a trade and commerce perspective, the tug-of-war between the two nations was a tie. Historically, the US had advantages in certain areas, including high-tech, internet and information communication technology sectors. The US also has extensive capital power as a reserve currency, thus controlling world's money and resources, which is indeed more powerful than China. Due to mismanagement, the advantages the US had accumulated in the first 30 years have been negated by the US' own mistakes. The 2008 financial crisis is a perfect example, which has handed China the best opportunity to surpass the US. The strengths the US historically had have now reversed and those same strengths have now become barriers to the US' economic development. The US-generated financial crisis like a flu was passed on from the US to most economies around the world, causing devastating damage to the world economy. It was a watershed. From that time, China started to gain significant advantages. But China has never experienced a landslide victory. The two countries are now in a stalemate, waiting for the other party to give ground. Being self-conscious to begin with, China was able to mobilize all positive factors and tools to maximize its strength. China took the lower-end technologies that the US did not want; China started up with assembly lines that the US had dumped; Chinese people accepted the industries with low-profitability and did the hard work that Americans would not do. US and Western entrepreneurs are quite complacent with themselves and deride China as the "world factory," implying the entire country of China is working for the US and the world. What they did not realize was that the hardworking Chinese people found great rewards from the world "junkyard." China has finished with technology and capital accumulation from the outdated technologies and capacities. The world has witnessed China rise from the ashes and transform itself into a confident and powerful country. The US has accused China of taking advantage of the US. This statement has definitely undermined the US. No country in the world has been able to take advantage of the US. With the US being the only superpower in the world, for any country to get something from it, that country would have to pay twice the price. The two countries have apparently different definitions of "taking advantage." The US imported massive amounts of goods from China to satisfy the needs of its own people. Cheap labor, low priced goods and materials and semi-finished products with low price in China have provided great benefits for the US families. In this sense, it is the US taking advantage of China. As the low priced benefit became less and prices rose, the US got irritated and started to badmouth China. 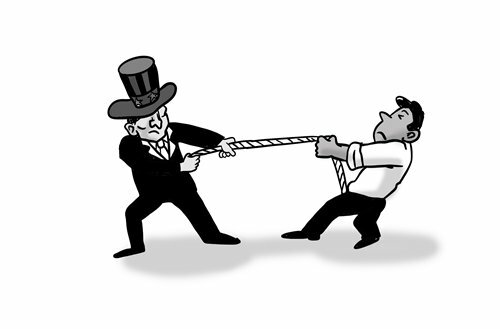 The ongoing China-US trade conflict is just a small episode of tug-of-war. It means some people in the US have lost patience, trying to enforce unacceptable rules on China. Stopping China growing stronger and harming China could affect the US development as well. It's noteworthy that the US has been trying to force China to follow its rules. China has seen through that, but did not do the same to the US. The world should be happy with China dealing with the US in a calm and composed manner, respecting the differences among countries, and never forcing countries to do things that they really don't want to do. Countries bullied by the US are always going to grow stronger and get significant support from the international society. The constant pressure the US exerts on China has enhanced China's defensive ability and unbending spirit. China has grown into a soft superpower while the US is still the annoying hard superpower. The US should not continue to make enemies. The tug-of-war between China and the US will keep going. The tug-of-war will continue for some time, and there will be no clear winner. We have to make sure it is still a friendly game, not a battle of survival. A balanced and stable China-US relationship will be a blessing for the world.